JAXA has included a replacement for their lost Hitomi X-Ray astronomy satellite in next year’s budget. A new documentary about the early days of NASA Mission Control: The Unsung Heroes of Mission Control was released last week. Marine, astronaut, and Senator John Glenn was laid to rest at the Arlington National Cemetery last week. The first launch was a much-anticipated flight from SpaceX. 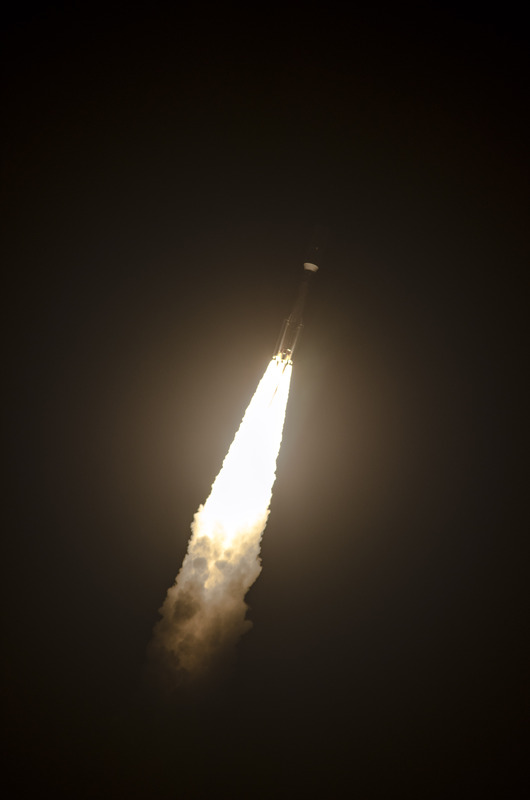 The launch on March 30th was a relatively routine launch of a communications satellite to geosynchronous orbit. What made it unique was the the first stage of the Falcon 9 rocket had previously been flown before on a NASA cargo launch last spring. The launch was flawless, including recovery of the first stage booster on the droneship at sea, marking the first operational reuse of a rocket by a commercial company (components of the Space Shuttle system, such as the Orbiter and the SRBs, were frequently reflown). Meanwhile, things have been very busy at the International Space Station. Astronauts Shane Kimbrough and Peggy Whitson conducted another spacewalk (designated US EVA 41) on March 30th. The pair of experienced spacewalkers managed to complete all planned tasks, including hooking up a new docking port at the front of the space station. However, the EVA was not without some excitement: one of four special thermal “shields” was accidentally dropped overboard and mission control teams had to come up with a plan to replace the shield in order to keep components of the ISS thermally protected. Shortly after the spacewalk, Commander Shane Kimbrough handed the space station over the Whitson and then returned to Earth with the rest of his Soyuz crew, completing Expedition 50. It was then announced that Peggy Whitson has agreed to stay onboard the ISS an extra 3 months and use a bonus empty seat on next week’s Soyuz mission to come home in September. Peggy will be the most experienced non-Russian astronaut in history when she comes home. New results from the Cassini spacecraft, which orbits Saturn, have shown that the “plumes” coming from the ocean moon Enceladus’ subsurface seas contain molecular hydrogen, which could be used by microbial life to conduct methanogenesis (like the life living near Earth’s deep sea hydrothermal vents). Measurements of elemental argon in Mars’ atmosphere by the MAVEN spacecraft have revealed that most of the planet’s atmosphere has been lost to space. Last week SpaceX secured a $1 billion dollar investment from Google and Fidelity. Google’s interest in the company is supposedly tied to their plans for an Earth-wide satellite internet system. Orbital Sciences has signed a contract with RSC Energia (the Russian state-owned corporation which includes NPO Energomash) to purchase enough RD-181 rocket engines to power 10 Antares flights. The engine replacement is needed to replace the AJ-26 engines which are implicated in the loss of an ISS cargo resupply mission last October. British singer Sarah Brightman has started her cosmonaut training in Russia. She will launch to ISS for ten days later this year. If you aren’t on Google+, one reason to join is to follow Samantha Cristoforetti’s posts from the ISS. She posts almost-daily updates on how her mission is going, which is a pretty good read. Her most recent posts include a summary of the false emergency last week and a cool student robotics competition they hosted onboard. These nighttime photos of cyclone Bansi are some of the most amazing pieces of Earth photography I have ever seen from the ISS. Here is an interesting pair of photos from Terry Virts. The Atlas V launch of a Navy communications satellite was successful on January 20th. This was the second orbital launch of the year, following SpaceX’s Falcon 9 launch on January 10th. Coming up this week, NASA’s Soil Moistive Active Passive (SMAP) satellite will launch on a Delta II rocket from Florida on Thursday, January 29th. Patrick Stewart was announced as the narrator for the new Journey to Space film which is coming out next month. Here is the trailer, which was released last month (and does not feature Stewart). I am excited for this! Interestellar: the return of hard sci-fi (or it never left)? This post is overdue. Interstellar, a huge success of a film, both critically and financially, has been out for almost a month. It has a rating of 8.9 out of 10 based on user reviews at IMDb and holds the #15 spot on the IMDb top 250. By this point, if you are a fan of space or sci-fi films, you have likely already found the time to see it. I am not going to write a point-by-point plot breakdown of Interstellar, nor am I going to pick apart the science of the movie. Those kinds of reviews, of varying harshness and quality, have already been written variously by fans and detractors of the film. Such a post by me wouldn’t sway your choice to see the movie anyway. Instead, I’d like to take a look at what appears to be a changing trend in the style and content of sci-fi movies in the 21st century, and what the recent success of movies like Gravity and Interstellar may mean for the future of science fiction films. Is there a trend back towards hard sci-fi? Hard science fiction is a category of science fiction characterized by an emphasis on scientific accuracy or technical detail, or on both… The heart of the “hard SF” designation is the relationship of the science content and attitude to the rest of the narrative, and (for some readers, at least) the “hardness” or rigor of the science itself. One requirement for hard SF is procedural or intentional: a story should try to be accurate, logical, credible and rigorous in its use of current scientific and technical knowledge about which technology, phenomena, scenarios and situations that are practically and/or theoretically possible. So which space-based sci-fis are hard sci-fis? A couple classic examples most people might be familiar with would be 2001: A Space Odyssey (1968), Silent Running (1972), The Andromeda Strain (1971), and Solaris (1972). These films were released right around the peak of the Space Race and the Apollo Program. The public could see and understand the romance and drama of a simpler space exploration story without marauding aliens, warp drive, or laser weapons. Another tempting franchise to include, Star Trek, was clearly influenced by the optimism of space exploration in the ’60s, as well. Star Trek, like the films listed above, was also in stark contrast to the earlier space operas that were little different than a cowboy adventure, only set in space. However, we can’t call Star Trek “hard” – after all, it has the warp drives and laser weapons I just ruled out. Star Trek has the veneer of science-focused storytelling, but lacks the “…credible and rigorous… use of current scientific and technical knowledge…”. However, in today’s era of the impossible physics of superhero and Transformers movies, which are clearly not science-based, the Star Trek of the 1960s sure looks sciencey by comparison. The world may have trouble feeding a growing population in the near future, and may suffer a population collapse as a result: This is plausible and backed up by a growing scientific consensus, due to climate change and population growth. NASA can’t work miracles: The film depicts NASA plausibly – having a hard time getting stuff done in a reduced budget environment. They can’t build the large space stations they want to and instead have to launch rockets and spacecraft of modest size to carry out their missions. Worm holes exist and it is possible to travel through them: Both facts are theoretically possible, mathematically. It takes a very long time for a spaceship to get from Earth to Saturn: Yup. Time dilation would occur on a planet orbiting a large black hole: this is the meat of why the film producers hired noted physicist Kip Thorne as a consultant. The water planet orbiting Gargantua was very plausible. Such a planet would have huge tidal waves: No. The planet would likely be tidally locked. There would not be a moving tide on the planet. There can be such a thing as frozen clouds on an alien planet: I’m not really sure what a “frozen cloud” even is. Don’t open an airlock if your spacecraft isn’t properly docked: plausible results here! And no sound of the explosion in space. High spin-rate spacecraft docking: not likely possible at the number of RPMs depicted in the film. But the characters are at least shown experiencing high-Gs in the scene. That’s just a sample of some of the things I noticed (items 1, 3, 5, and 6 backed up by people smarter than me). So it seems clear that the filmmakers did make an effort to get many things right in Interstellar, while at the same time taking some creative license for the sake of stunning visuals or dramatic effect. Interstellar is probably somewhere in the middle-ground; farther towards “hard” than Star Trek, but not at the level of 2001: A Space Odyssey, which many people have been comparing Interstellar to, due to certain plot elements. So, this is why the definition of hard sci-fi I quoted above mentions “trying” to be accurate. If we are going to be strict about the definition and say a hard sci-fi must be perfectly scientifically accurate, it may be very difficult to find a movie that is a true hard sci-fi tale. So, in order to draw the line somewhere – and since this is my blog – I am going to loosen up my definition of “hard sci-fi” but give more parameters than just “trying” to be accurate. Let’s define a hard sci-fi as having astronauts instead of adventurers (see, Dave of 2001 instead of Kirk of Star Trek), having realistic spacecraft technology (for example, artificial gravity is only possible through centrifugal force), and no unreasonable alien encounters. I like to think of these kinds of movies as “astronaut movies” – they are the ones that feel realistic to guys like me that work at NASA. Using this definition, I have compiled a list of all the astronaut movies since Apollo 13 in 1995 (the pinnace of what a successful astronaut movie can be). By my count, there have been about 20 movies since Apollo 13 that have either been fair “astronaut movies” or have come close, but fail my smell test in some way. I have colored films that are clear successes in red and indie films (for which a flop/hit designation based on gross sales is meaningless) as blue. Three of the other movies made more money than they cost but not enough for me to firmly declare them as hits. Two things stand out to me in this data. The first is that even when we include the “fantasy” movies that are almost astronaut movies, but not quite, you still see a long drought of mainstream successful films of about 10 years or more. Second, in recent years there is a ramp-up in “indie” films in the astronaut genre, which is promising if you were a fan of Moon, Sunshine, or Europa Report. Leaving in the three campy films of Armageddon, Deep Impact, and Space Cowboys makes the story look a bit better. But if you don’t like camp, then there really was a true drought of a good mainstream astronaut based film for nearly two decades. By all accounts, Prometheus (which I have not seen) is so full of non-scientific plot elements, not to mention aliens, that I probably shouldn’t include it. But since it features astronauts in spacesuits, I thought it was close enough to my definition to at least get a comparison. It seems to me that Gravity and Interstellar signal a true return of hard sci-fi films to the mainstream. With Ridley Scott currently working on The Martian, starring Matt Damon along with other big names, the trend is going to continue for now. And if The Martian stays true to the source material, it really will be the hardest astronaut film since Apollo 13. Those of us who pride ourselves on being nerds or geeks and have heard of Sunshine, Europa Report or Gattaca, or liked Red Planet, would be justified in saying that hard sci-fi never left film, it just went underground. But the fact that you have seen all those great films does not affect the public consciousness; they are not becoming a part of culture. What becomes culture is a mainstream movie that everyone has heard of and seen. It may seem silly, but a film like Gravity can do a simple thing like remind Americans that their tax dollars are paying for an International Space Station. A film like Interstellar may get a kid interested in black holes and she may voluntarily read some physics books. Why not get a little science along with your entertainment? What cost are you willing to pay for the future of humanity? Is man’s nature inherently selfish? Can love of family overcome that inherent nature? Or does love simply lead to more selfish acts? Is humanity worth saving if in the restarting, cultural history is lost? These kinds of questions are the hallmark of a film that makes an effort to reflect reality back at us, rather than let us escape into fantasy. This is the kind of space adventure that will get people talking and thinking. I say give us more! Go see Interstellar.